The demonstrations in Togo on 19 August called for a limit to the number of presidential terms. That demonstration and the one on 6 September, which brought together more than 100 000 people in Lomé, revealed a new person of the Togolese opposition, Tikpi Salifou Atchadam, and introduced him to an international audience. He is the leader of the Pan-African National Party (PNP) and has succeeded in unifying the opposition against the Gnassingbé dynasty by allying himself with longtime opposition leader Jean-Pierre Fabre to overcome the communal divides. Mr. Atchadam had never participated in a presidential poll until now and his party, PNP, created in 2014, has no representation in Parliament. He is not, however, new to Togolese political life. Tikpi Atchadam was born in 1967 in Kparatao, near Sokodé, in the Tchaoudjo region of northern Togo. 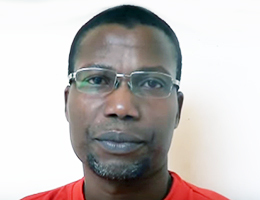 He is a lawyer by training and holds a DEA in private law as well as a master’s degree in anthropology and African studies, with a focus on legal anthropology, from the University of Lomé. In 1995, he joined the general secretariat of the prefecture of Tchaoudjo and, a year later, he joined the Ministry of Justice and Human Rights where he would be employed until 2006. Between 2000 and 2002, he was a member of the Independent National Electoral Commission (CENI), where he was secretary of the age division and rapporteur of the commission in charge of communication as a civil society representative. Close to the Pan-African Socialist Party in his youth, he subsequently took his voter card to the Democratic Party for Renewal (PDR). When this party joined the presidential majority in 2005, Tchikpi Atchadam distanced himself from the Togolese political scene. He returned in November 2014 and created the PNP, which was a non-event in a country that has nearly 120 political parties. The PNP did not participate in the 2015 elections, but joined s the “Front Tchoboué” that gathered several parties together who wanted to reform the current regime. After that, Tchikpi Atchadam worked more on the ground and built up both his popular base in his city, Sokodé and his financial and diplomatic base within the Togolese diaspora, which is particularly numerous in Germany. Although Tikpi Atchadam initially based his support on his native region and his native the Tem population, he is now positioning himself as a national opponent, having allied himself with Jean-Pierre Fabre who represents the country’s southern regions. With a party that has a large local presence and this massive popular mobilisation, Tchikpi Atchadam is now getting ready for the 2018 parliamentary and local elections.